Coffee addicts, get pumped: American Eagle’s latest line of jeans comes with a side of java—recycled java, that is. The retailer’s “Denim x Café” and “Flex/Café” collections, which debuted Thursday, feature 2.25 grams of spent coffee grounds per pant. Stripped of fragrant compounds, such as phenols, oils, and esters—so you don’t smell like a fresh pot—the fabric is said to wick away moisture while protecting against ultraviolet rays. Another plus: Because coffee grounds are naturally deodorizing, American Eagle claims you can squeeze a few extra wears between washes. 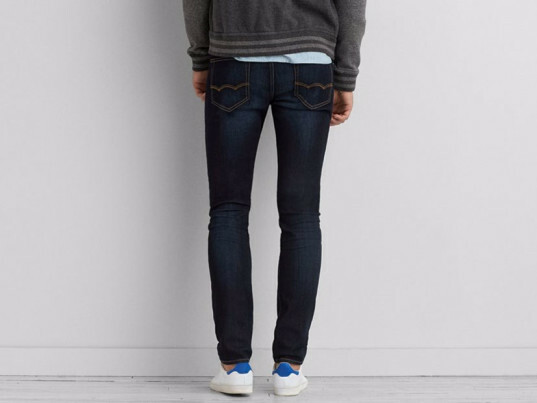 Ranging in price from $44.95 to $54.95, the jeans come in jegging, “tomgirl,” and skinny versions for the ladies, as well as slim, slim-straight, skinny, and super-skinny fits for the gents. Washes run from creme blue to dark indigo. American Eagle isn’t the only brand to get buzzed on caffeine. Sloggi has a line of knickers derived from waste coffee. In February, British stalwart Marks & Spencer introduced a line of shoes derived, in part, from post-consumer waste, including used coffee grounds and discarded plastic bottles. A company known as the Ministry of Supply has even applied coffee’s odor-eating properties where they’re needed most—your feet—with what it dubs the “Brita filter” of socks. Looking to class up your wardrobe? Designer Rosalie McMillan has an elegant range of jewelry made from Çurface, an industrial composite derived from leftover grounds and post-consumer recycled polystyrene.